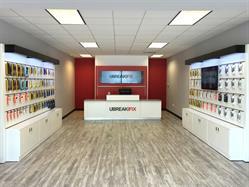 SAN JUAN, PUERTO RICO--(Marketwired - June 26, 2017) - uBreakiFix is now open in San Juan, Puerto Rico. The fast-growing technology repair brand provides same-day repair service of all electronics, specializing in cell phone repair and computer repair at its more than 310 locations across North America. This is the brand's first location in Puerto Rico, and uBreakiFix San Juan is the first location for owner Edgardo Garcia. "We want to be known as the go-to tech repair store for the San Juan community," Garcia said. "We take great pride in what we do, and believe the services we provide are necessary and beneficial for our community. It is very exciting to help bring uBreakiFix to Puerto Rico." uBreakiFix was founded in 2009 by millennial duo David Reiff and Justin Wetherill, a 2017 Forbes 30 Under 30 honoree. The pair later partnered with Eddie Trujillo to transition their Internet-based brand to a brick and mortar tech repair alternative that was quick, affordable and provided a quality customer experience. Since its inception, the company has grown organically without debt, investors or consultants. uBreakiFix services all brands of electronics, offering phone screen repair, computer repair and more to consumers and businesses alike. To date, the company has completed more than 2.5 million repairs, including cracked screens, water damage, software issues, camera issues and most other technical problems. uBreakiFix has more than 310 locations open across the U.S. and Canada, with nearly 700 in development. uBreakiFix is known for its timely service, focus on providing an exceptional customer experience and its ability to fix anything and everything with a power button. Each repair comes with a 90-day warranty and a price match guarantee. "Our commitment to our customers is what drives our continual growth, innovation and improvement," said Wetherill, uBreakiFix CEO and founder. "We're always looking for ways to better serve the communities we call home. We're excited for the opportunity to bring reliable repair service and exceptional customer service to San Juan and the surrounding areas." uBreakiFix San Juan is located at 205 Calle Federico, Costa Montemar Plaza, San Juan, PR 00918 and can be reached at: (787) 333-6044. For more information and to view a service menu, visit ubreakifix.com. Founded in 2009, uBreakiFix specializes in the repair of small electronics, ranging from smartphones, game consoles, tablets, computers and everything in between. Cracked screens, water damage, software issues, camera issues and most any other problem can be repaired by visiting uBreakiFix stores across the U.S. and in Canada. uBreakiFix is the official walk-in repair partner for Pixel, a phone by Google. For more information, visit ubreakifix.com. uBreakiFix specializes in same-day repair service of small electronics, repairing cracked screens, water damage, software issues, camera issues and other technical problems at its more than 310 stores across North America.